Nae tae be confused wi Democratic Republic o the Congo. The Republic o the Congo (French: République du Congo; Kongo: Repubilika ya Kongo; Lingala: Republiki ya Kongó), an aa kent as Congo-Brazzaville, Little Congo, or simply the Congo, is a state in Central Africae. 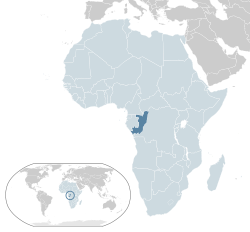 It is bordered bi Gabon, Cameroon, the Central African Republic, the Democratic Republic o the Congo (umwhile kent as Zaire), the Angolan exclave province o Cabinda, an the Gulf o Guinea. The region wis dominatit bi Bantu tribes, who built trade links leadin intae the Congo River basin. The republic is a umwhile French colony. Upon unthrildom in 1960, the umwhile French region o Middle Congo became the Republic o the Congo. The Fowkrepublic o the Congo wis a Marxist-Leninist single-pairty state frae 1970 tae 1991. Multipairty elections hae been held syne 1992, although a democratically elected government wis oostit in a 1997 ceevil war. ↑ 2.0 2.1 2.2 2.3 "Republic of the Congo". International Monetary Fund. Retrieved 25 July 2017. ↑ "GINI index". World Bank. Retrieved 12 September 2015. ↑ "CIA – The World Factbook – Congo, Republic of the". Cia.gov. Retrieved 2008-12-26. Wikimedia Commons haes media relatit tae Republic of the Congo. This page wis last eeditit on 4 Apryle 2018, at 05:51.